I am so very happy to present the 10th MaiTai Collection in action collage today! The contributions are from Australia, Austria, California, Denmark, France, Hawaii, Ohio, Russia, Saudi Arabia, Singapore, Texas, United Kingdom and Wyoming. Marla in the OC: Works as a personal stylist in the OC area. For anyone interested, please send an email to maitaicollection@orange.fr, and I'll forward it to her! Clockwise from top left: Faux Fuchsia with a 'Très Kelly' 70 carré, tied with a Moyenne Classique scarf ring into a criss-cross bow knot. Blighty with a 'Monsieur et Madame' Gavroche, secured with a Classique Moyenne MoP scarf ring in the basic slide. Marla in the OC also with a 'Monsieur et Madame' Gavroche, worn with a SAGA fox fur collar in khaki (two loop method). msT with a 'Aux Portes du Palais' plissé, ends secured with a Classique Petite scarf ring in bone, in the basic slide. 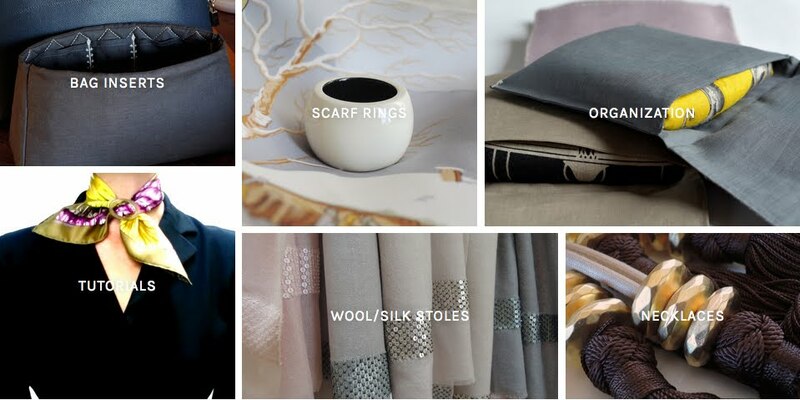 Clockwise form top left: gkaroma with a 'L'art de Temari' cashmere GM, tied with a shawl ring in translucent horn in the basic slide. Horn bangle in mushroom. Jasmine with a taupe SAGA fox fur collar, held in place by south sea pearls on a white gold strand. Faux Fuchsia with a 'Circus' 70 carré, tied in the basic slide with a Grande Classique scarf ring in honey horn. Hope everyone is enjoying a lovely Easter weekend, and wishing you all a very happy Easter! Congratulations on the 10th Annual MaiTai In Action Collage! Thank you ladies for sharing w/ us your treasures and how you style them--I sure love how you've shown us how to tie loose ends w/ a mini-MTC ring, and how to secure a large volume w/ the grande-MTC ring. Those are just 2 absolute 'must haves' which bridge a gap for scarfies/shawlies. Wow, MaiTai Collection "Little Oatie" Bag Insert!!! What genius you are dear MaiTai! The sole reason I have hesitated all these years from buying a Pictoin is the unlined nature of the bag--I don't like small pieces of suede bits all over my purse contents, esp. Kleenex!!! But, you have solved this problem w/ a stroke of genius. (as usual, dearest, as usual!). Thank you for inventing such clever + practical items, and sharing your world w/ us. Thank you, Susan. It’s them who make the scarves glow! forgot to mention--LOVE the brushed cotton sateen pochettes! they are gorgeous and that shine is just so luxurious! ...or the ultra smooth silky 100% cotton, which really heightens the sophisticated soft neutral colors, as well as that cheery hot pink color. such a delight to come here and behold your creations. Thank you MT!!! I have enjoyed reading your blog for years, simply for the style and beauty as I am not a scarf wearer. Until today that is! I came home with an au coeur de la vie in white/red/beige. I now have many hours of practice ahead of me, following your wonderful tutorials. Hello dear Jo! Many congratulations on your beautiful ‘Au coeur de la vie’! It is so nice to know that you’ve enjoyed the blog posts without having been into scarves, and with your new scarf, I hope you’ll enjoy them even more! Ps I meant to ask which scarf ring would you recommend? A Grande Classique is the most versatile size for 90 carrés, and a honey would be lovely with your CW! Dear MaiTai, thank you for including my pictures. 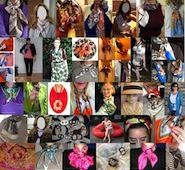 I love these collages, to watch all these elegant ladies wearing their beautiful scarves gives me so many ideas. By the way, the new carre pochettes are very luxurious, I love them all. Thanks so much again for taking part, dearest Perla! Love all your pictures, you are so creative and beautiful! Thank you for including me with all these gorgeous women, 2 of whom are my real life friends!! Merci très chère MAI TAI ! Many thanks, and have a very happy Easter too! How fun...you have some seriously stylish readers! Wishing you a happy and healthy Easter! Merci! Have a most wonderful and happy Easter too! Wow, what a chic collective you have! Dear MaiTai, I am thrilled to be included in your collage and in such glamorous company, so relieved I slapped some make up on for the photo. Thank you very much and hope you are having a lovely Easter. This post could be called Beauties of the World . What a bunch of lovely ladies follow your blogs. Your post on leopard skin print was very interesting. Previously I was not a fan but I think having seen your styling of same I could be converted! Thank you for the inspirations . I could not think of a lovelier group of ladies than those in the collage, and those who comment here. I haven't been a fan of cat prints either, but now that I own the pieces I enjoy reaching for them! What a fabulous collage! Thank you so much for including me in such stylish company—and many thanks for the shout out! Blighty—we’re twins! I love that little gavroche. Gavroches are such useful little outfit lifters. Love those pochettes! Such a clever idea. Returning from Morocco I find your beautiful collage of your ladies, all very pretty. Happy easter to you dear Mai Tai. 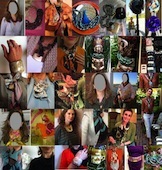 Thank you so much for including me again in your beautiful collage, among so many stylish ladies. 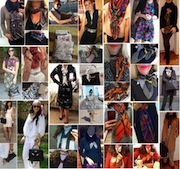 It´s so much fun to see how everyone wears their Hermès scarves and the beautiful pieces from the Mai Tai Collection. Beautiful collage! What a wonderful way to learn from others! I've been reading your blog for a few weeks now, since I found it, catching up with the older posts and loving them all! A warm belated welcome to you, dear Wanda! So nice to know you enjoy the older posts too. Hope your package will be with you soon, and wishing you much fun playing with your new scarf rings! what a surprise to find "my" scarf with "your" scarf ring in your collage. It feels great between all these beautiful ladies with all their lovely scarves and how they wear them. Great collage! so exciting to be part of it and thank heavens for MT scarf rings. As we say here in Australia... they are a GAMECHANGER!! Dear lovely ladies, thank you for your contributions. Dear MaiTai, thank you for your generosity allowing us to see all beautiful photos. Great teacher and great followers! Thanks so much for the lovely comment, dearest Lea. Love the photos too. Hugs right back. so thrilled to see myself in your 10th collage. Thank you so much for including me with all these beautiful ladies. I got more ideas of how to wear scarves. Thank you so much for your contributions! So thrilled to have you in the collage, my dear gkaroma! Thanks so much again for sending the pics. Hope to see you again in #11! Question for you gorgeous females -- how do you take such great photos of yourselves? Any tips for my fumble-fingered self? I would love to be included in a future "MaiTai Collection in Action" but my photos turn out blurry! Hello dear Fifi! If you have an autofocus camera, make sure to focus into your mirror image face. It's best not to use a flash, but to have as much natural light as possible (a good place for the mirror is near a window). Wishing you the best of luck, and hope to include your pictures into collage #11! Hope you enjoyed your April so far. So fast that the month is coming to an end. I saw your posting while I was travelling for work and just got back. Thank you for putting me here with all the lovely ladies. It's a delight watching real women in action rather than pencil thin perfect faced models whom we can't relate to! While travelling, I can't help but pick up another scarf from Hermes due to the inspiration from you. It has always been a hassle wearing scarves here in Singapore due to the weather, and when we do, we get mistaken for being an airline staff or working in the Japanese departmental stores. However, I started with the maxi twilly and began to get compliments because not many people wears them here. It's really how you wear it, and the designs or the prints. I just bought the Mystique Phoenix from Seoul, and absolutely looking forward to purchasing your scarf rings to go with them. Can't wait but first, I've to stop skiving and finish my work! LOL!! Wishing you well and keep inspiring! !